Who doesn't love a good wedge or espadrille during the summer?! Shoes are one of my favorite parts about the summertime because of (go figure) the color! I love to dress colorful in all seasons but summer is by far one of my favorites for this. Not to mention how great the look with those little summer dresses! Even shorts with a loose-fitting blouse looks great with shoes like these. Today I've thrown together a few of my favorite wedges for Summer '15. 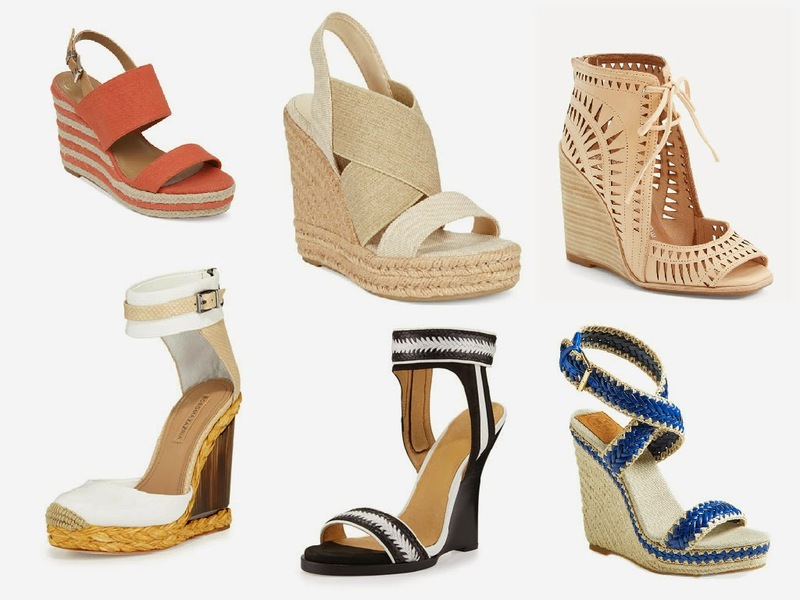 I think my favorite are the BCBG espadrilles (bottom left). They tie in the braided look, tortoise and linen all in one. A simple light pink dress would be absolute perfection with these wedges. The Tory Burch blue 'Lilah' wedges would be perfect for celebrating the 4th of July! Summer brings all kinds of occasions to celebrate with fun summer fashion.